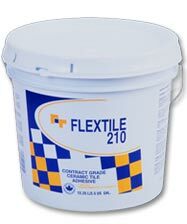 White non-flammable latex type 1 adhesive for laying all kinds of ceramic and mosaic tiles on walls or interior floors. Can be used on concrete, expanded concrete panels, water-resistant gypsum boards and, in dry areas, plywood and gypsum board. Adhesive with excellent adhesion to most substrates, low odor, with high freeze-thaw stability, easy to apply, ecological and solvent free. Excellent adhesion to almost any kind of media. Good slip resistance for vertical application.